Invasive earthworms can alter the carbon and nitrogen cycles in woodland, as well as undermining native plant species, a study suggests. US researchers found that the presence of non-native worms also accelerated the breakdown of forest litter, increasing the risk of soil erosion. The worms are spread to new areas by horticulture and land disturbance, they add, as well as on vehicles' tyres. The findings have been published in the journal Human Ecology. "The presence of earthworms in temperate hardwood forests may accelerate decomposition of forest litter, which potentially reduces habitat for forest-floor animals, (increases) soil erosion... and affects carbon and nitrogen cycles," the researchers from Colgate University, New York, wrote. Quoting a previous study, the scientists said that invasive earthworms could reduce the amount of carbon stored in soil by up to 28% as a result of the animals eating fallen leaves, which had a knock-on effect on the temperature of the forest floor. Dark soil absorbed more solar energy than lighter leaf litter, causing the soil to dry out more quickly. 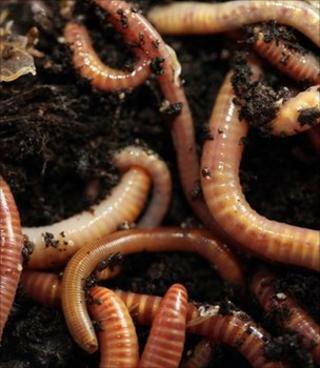 As well as altering the chemical composition of soil, the worms also had an biological impact because the thinner layer of litter reduced populations of a number of forest-dwelling flora and fauna, such as small mammals, ground-nesting birds and some threatened fern species. The team, whose study focused on the forests of north America, suggested that there were a number of factors behind the dispersal of non-native worms across the landscape. These were primarily the result of human activity, because after being wiped out in the region during the last period of glaciation, earthworms would have made a very, very slow advance northward, covering just a few hundred kilometres over the past 10,000 years. The shipping and transplantation of soil in the horticulture industry is believed to be one factor. The researchers also said that previous research had shown a strong correlation between the presence of roads and the number of worms found in the area, probably the result of the combination of soil disturbance and worms being dispersed by vehicles. As well as the unintentional spread, the team indentified a number of "intentional" vectors. One was the use of Lumbricus rubellus (red earthworm) in community compost heaps. But the biggest problem came from the disposal of fishing bait, which the researchers described as "the most important vector for widespread and scattered exotic earthworm introduction in remote areas". Although Lumbricus terrestris (common earthworm) is native to temperate regions of Europe, it is considered to be an invasive species in North America as it thrives in agricultural marginal land and is deemed to inhibit the growth of native flora in these areas. Yet within parts of Europe, the common earthworm itself is struggling to compete against flatworms that were introduced from Australasia. However, a study published earlier this year that examined the role of worms in the carbon cycle of tropical forests found the creatures had a net benefit in terms of locking carbon into the soil. Within an area of rainforest in Vietnam, the researchers found that casts (excretions of digested organic matter) produced by a species of worm had higher concentrations of carbon, and were able to withstand about twice as much rainfall, than surrounding "control" soil samples. As a result, the team concluded that the presence of worms enhanced the transition of organic material into soil aggregates. Soils with many aggregates (clumps of soil particles and a mixture of organic and fungal matter) are considered to be more stable and less prone to erosion.